The Pressure Gauge allows the visualisation of pressure of system of pipes. The Pressure Gauge is characterised by its simple handling. With a screen of 4 digits the measurement values are visualised with high accuracy. Thanks to the integrated battery, the Pressure Gauge does not depend on a fixed power supply. The bar chart shows the pressure tendency. The backlight guarantees optimal reading and manageability even with little illumination. The pressure peaks are registered thanks to the sampling speed of 10 ms. Due to its good price-perfomance ratio, this equipment offers all the advantages of a digital pressure measurement device. 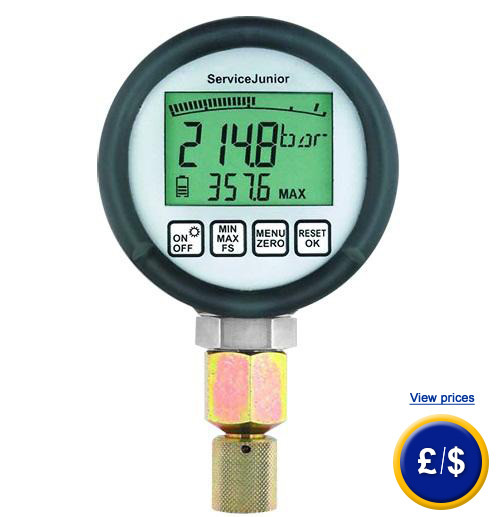 If you have any questions regarding the Pressure Gauge, please see the technical specifications bellow or contact us. 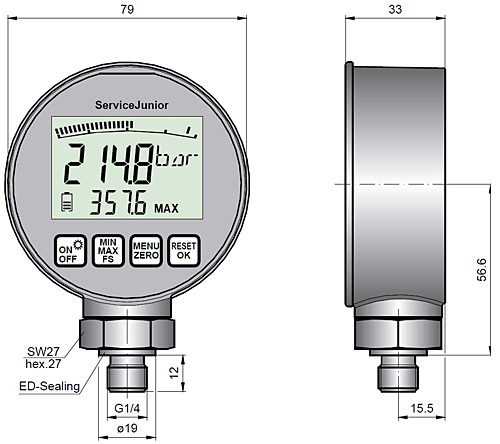 Our engineers and technicians will be pleased to help you with the pressure manometers and with the other Regulations and Control products. Here you will find a general overview of the meters or the Measuring instruments, and scales of PCE Instruments. Accuracy ± 0.25 % FS typical ± 0.5 % FS max. For companies that wish to integrate their pressure manometer in their internal control of quality or for the annual recalibration. The certificate, according to ISO norm, contains a calibration of laboratory including the certificate with all the values of measurement. The name and the direction of the company or the person that requested it are also indicated in the certificate.